Thirty years ago, Megan Provenzino’s father gave up coffee. His switch to classic black tea sparked her passion for the hot beverage, and eventually led her to open the quaint Midtown teahouse and art gallery whose name is inspired by his Greek heritage — Socra Tea. “Tea has always been a part of my life,” co-owner Provenzino says. But her tastes quickly developed well beyond her father’s. “I’m the one that experimented more with teas, with wanting to learn more about teas and having more flavorful teas,” she says. Once she became an adult, Provenzino says she couldn’t find a good place in the community where people could go to properly appreciate and learn about tea. So she decided to open her own spot in December 2012. The unique name is a play on the Greek philosopher Socrates. The name — and the idea to open a shop — was decided upon by the whole family, including her mother, father, and husband. The shop is nestled in a cozy basement space of the renovated Garfield building on a pedestrian walkway between Forest and Garfield streets. Cinnamon and nutty aromas welcome you through the front door and down the stairs. The spot is adorned with wooden décor including tables, shelves, and a detailed wall all made out of recycled materials from a Hamtramck house. Board games and books are tucked in a corner, as are a selection of community leaflets. All those things — and a cup of hot tea — make Socra Tea feel like a welcoming place that’s almost like a second home. The shop’s employees add to the feeling by familiarizing themselves with guests and remembering their usual drinks. If you’re not exactly sure what your cup of tea is, they will gear you toward something you will like, letting you smell the loose leaf teas before choosing. The tea wall — shelving that fits 65 tin cans and overflows onto the adjacent windowsill beside the cash register — contains more than 80 organic teas from around the world. They range from herbal, white, green, black, and oolong teas with flavors such as blueberry mango, caramel sesame cookie, chili chocolate, and peanut butter and jelly. 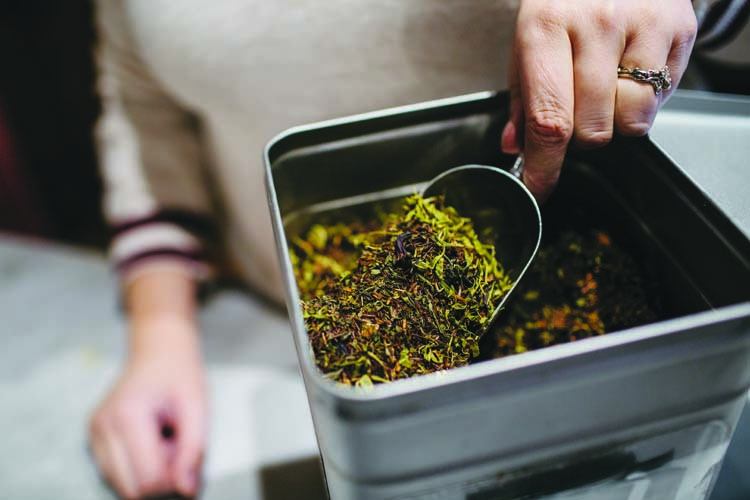 Provenzino says teas can be hand-rolled — primarily a Chinese method — broken down, and bruised. And the flavors are altered through oxidation, the chemical process that results in the browning of tea leaves. Provenzino says she chooses all the teas that come in, partnering with Lisa McDonald, the owner of TeaHaus in Ann Arbor. TeaHaus works directly with a German company when ordering, and Provenzino says Germany is the ideal source because the country tests tea for purity, something not enforced in the United States. All their teas are tested for pesticide and heavy metal residue. All of the teas at Socra Tea are also 100 percent organic, which is a concept that’s very important to Provenzino. 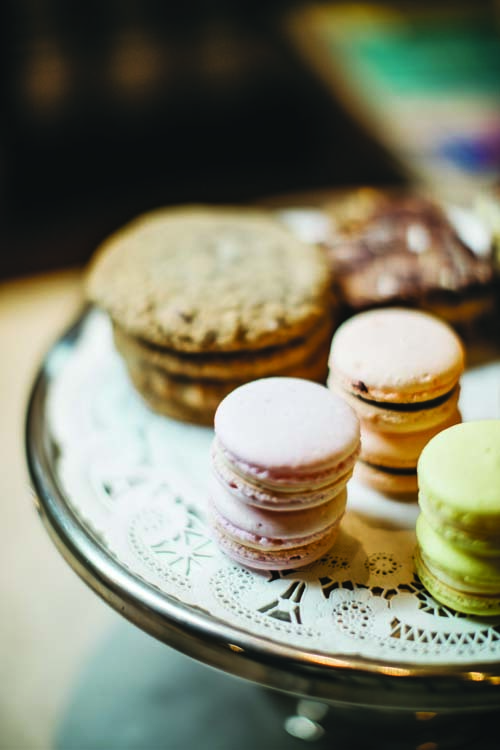 Socra Tea also offers pastries made by local artisans, including quiches by Amour de Quiches, croissants by Golden Harvest, macarons by Blu Kitchen, and gluten-free goodies by Ethel’s Edibles. The space doubles as an art gallery, and Provenzino likes to promote Detroit artists as much as possible. Pottery and glass jewelry provided by the Socra Tea’s neighbor, Sugar Hill Clay, line the shelves near the entrance; Michigan-themed magnets and Detroit-inspired candles are displayed around pillars and tables; and paintings and drawings adorn the rust-colored walls, with artists rotating quarterly. Provenzino also promotes tea education, offering tastings and classes to teach guests how to temper tea correctly when they buy a bag to take home. There are also infusers, baskets, filters, tea presses, and other tools of the trade for at home DIY types. Provenzino also likes to point out the “healing” benefits of tea, noting that herbal teas are a different breed than white, green, black, and oolong ones.